In the second study, a team of French, Belgian, and Japanese researchers, including Sébastien Charnoz from the UnivEarthS team “From dust to planets”, used cutting-edge digital simulations to show how these satellites were able to form from the debris of a gigantic collision between Mars and a protoplanet one-third its size. This research, which is the result of collaboration between researchers from Université Paris Diderot and Royal Observatory of Belgium, in collaboration with the CNRS, Université de Rennes 1 and the Japanese Institute ELSI, is published on July 4, 2016 in the journal Nature Geoscience. In one of these studies, a team of Belgian, French, and Japanese researchers offers, for the first time, a complete and coherent scenario for the formation of Phobos and Deimos, which would have been created following a collision between Mars and a primordial body one-third its size, 100 to 800 million years after the beginning of the planet’s formation. According to researchers, the debris from this collision formed a very wide disk around Mars, made up of a dense inner part composed of matter in fusion, and a very thin outer part primarily of gas. In the inner part of this disk formed a moon one thousand times the size of Phobos, which has since disappeared. The gravitational interactions created in the outer disk by this massive star apparently acted as a catalyst for the gathering of debris to form other smaller, more distant moons. After a few thousand years, Mars was surrounded by a group of approximately ten small moons and one enormous moon. 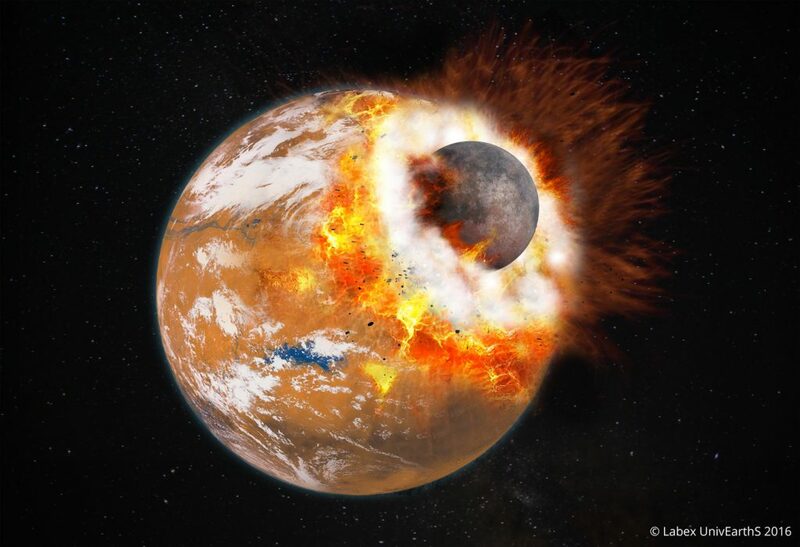 A few million years later, once the debris disk had dissipated, the tidal effects of Mars brought most of these satellites back down onto the planet, including the very large moon. Only the two most distant small moons, Phobos and Deimos, remained (see the graphic at the end of the press release). This research received support from IPGP, the Labex UnivEarthS, ELSI, Kobe University, Royal Observatory of Belgium and Idex A*MIDEX. French laboratories involved: Laboratoire d’astrophysique de Marseille (CNRS/Aix-Marseille Université), Institut de planétologie et d’astrophysique de Grenoble (CNRS/Université Grenoble Alpes), Centre européen de recherche et d’enseignement de géosciences de l’environnement (CNRS/Aix-Marseille Université/IRD/Collège de France). ESA’s European Space Research and Technology Centre was also involved. French laboratories involved: Institut de physique du globe de Paris (CNRS/IPGP/Université Paris Diderot), Institut de physique de Rennes (CNRS/Université de Rennes 1). Reconciling the orbital and physical properties of the martian moons, Thomas Ronnet, Pierre Vernazza, Olivier Mousis, Bastien Brugger, Pierre Beck, Bertrand Devouard, Olivier Witasse, Fabrice Cipriani. The Astrophysical Journal, forthcoming.